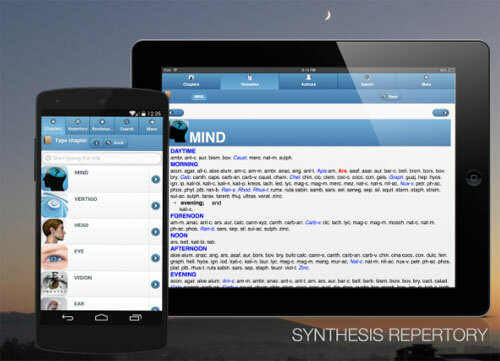 The Synthesis App is a powerful standalone application featuring the Full Synthesis 2009V (incl. veterinary rubrics). The search function will find any rubric anywhere in the repertory. Or to bookmark it in the repertory. Here you also have the option to turn the remedies view & author view on or off. In this example neither option is selected. Scroll down to view the simple analysis. This is a simple numerical analysis based on the sum of symptoms first and on the sum of degrees second. Select RadarOpus xml and use with your RadarOpus program. Then continue working on your case and save to your patient file. Yes, you can try out the Synthesis App by downloading the demo (lite) version. There is no time limit on the demo (lite) version. The demo/lite version does not allow the export to RadarOpus and contains only two chapters (“Eye” and “Vision”) while the full version contains all 41 chapters. Although the App can be downloaded by anybody, this application has been specifically created for homeopathic practitioners or students. Hence, it is not suitable for the general public. You will need homeopathic training in order to know how to use the homeopathic repertory effectively. Yes, you can use this app in the same way as you would use the Synthesis repertory book. You also have the benefit of additional veterinary rubrics, and what is more – you can have the Synthesis with you on the go. All versions can be downloaded from the Android/Apple/Windows App Stores. The Synthesis App is based on the Synthesis Repertory edition 2009, published by Dr. Frederik Schroyens. (Veterinary symptoms in the English and German versions only). Synthesis is used worldwide and is known to be the most comprehensive & most reliable repertory.